Membership to our community is by invitation only. 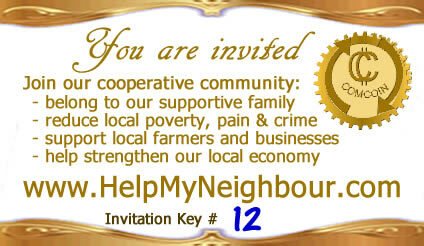 If someone invited you, they should have given you a number, which is your Invitation Key, so you can join our community. If you do not have an invitation yet, contact us and we will send you one. To join our cooperative community, please follow the steps below. Read our Frequently Asked Questions from the top right FAQ button. or download the PDF file available below (please scroll down). Download the Membership Agreement (see below) and read it entirely. Download the Membership Application and fill out the required info. If you are responding to our 30-day free trial, then check that box on the application form. If you received a promotion, please add a note on the application form so we know an apply that promotion to your account right away. Hand-sign your application and send it to the email below as a PDF or a readable scan/picture. When the free trial or the promotion ends, you can continue membership by clicking on the "Subscribe" button below and paying your $25 yearly membership fee. Once your request to join is approved, and we set up your account, you will receive an email with a link to login. For security reasons, this link is only good for one login, and it expires in one day. Once you follow the link and log in, please remember to set up your password. In case your link is expired, or you forgot to set up a password, you can still resolve the problem. Go to the login section and request a password reset, which will send you a brand new link to login. You must input your email, and pass a case-sensitive Captcha test (to verify you are a person, not a spamming machine). Please make note of your Account Number, as you will need it for future logins. Your account number is also the Invitation Key for any referrals you make, which will give you ComCoins to spend. Once you login, you can immediately do the following. Bid on "offers" and "wants" posted by other members. Post your own "offers" and "wants", thus creating more exchange opportunities for yourself. You can download the Offer/Want Categories (below) for a more visual inspiration. You can also visit our FAQ page for more information and inspiration. Receive help - even before you earn ComCoins. We allow your account to go in minus (up to a limit), and trust you to make every effort to help other members in order to bring the balance above zero, ASAP. Start earning ComCoins through referrals. We reward CC10 for each successful referal that joins our community for the 30-day free trial. We add CC15 if they pay the membership dues of $25. Make sure to give them your account number, as that is their Invitation Key. This is necessary for two reasons: First, it allows them to apply for membership, as our community can only be joined by invitation. Second, it ensures that the referral ComCoins are credited to you. When you GIVE to the community (by posting offers and finding someone to accept them, or by fulfilling someone's wants. ), you earn ComCoins. When you RECEIVE from the community (by posting wants and finding someone to fulfilll them, or by accepting someone's offers), then you spend ComCoins. If you receive help before giving, then your account goes in minus (allowable up to a preset limit). As a responsible member of our community, we would hope that you will soon start giving to the community and earning ComCoins, so that your account comes back to zero and goes to a growing positive value. Offers and wants are listed in our Categories, and are visible if you click on the "Offers" or "Wants" buttons. A member chooses an item and makes contact with the member who posted it, to negotiate an exchange. Members agree on its value, and proceed with the exchange of the goods or services involved. Then a transaction record is created by the person who is paying. The website will keep track of all transactions, and each member's transaction history is maintained, being visible to all members. Tasks. We are a volunteer-run community, and a lot of tasks need to be shared among us. We post regular and occasional tasks on our websirte. Members can check the task lists, and they can choose the ones they want to do. Depending on their nature and weight, some tasks are rewarded though our recognition system, others are paid in ComCoins. Offline activities. From time to time, we will organize an informational meet-and-greet event for new commers, followed by a networking meeting open to all members (signup required to ensure size of venue and refreshments). An annual meeting will be held every year, in September. The next newcommers event and networking meeting will be held at Surrey Night Market on June 3rd 2016, at 7 pm. 1. Share about us. Help My Neighbour ("HMN") will reward in ComCoins (CC) all your referrals that sign up within your first month of being a member of our community. Feel free to invite your facebook friends, work colleagues, business associates, customers, etc. You will receive CC10 for each person that signs up for our 30-day free trial, and an additional CC15 when they pay their $25 yearly membership fee, You can exchange your ComCoins for goods and services offered on this site by other members of our community. IMPORTANT: When you invite someone, you must give them your Invitation Key, which is your account number. That is the only way we may know who to credit for the referral. We ask everyone for an Invitation Key when they apply, and keep that in our records. To make this easier for you, you can download our printable invitations (see below). There are 12 business-card-size invitations per page, and they are easy to cut (use a ruller to draw cutting lines, if you need a guide). Take the PDF file to a local printing service, and colour-print as many pages as you want. It is best to use a good card stock, otherwise it looks cheap. Please hand-write (with a blue pen) your account number - as the Invitation Key. Then you can take a picture of such an invitation (with your key written on it), and post it on your facebook/etc, inviting your friends to sign up using your key. 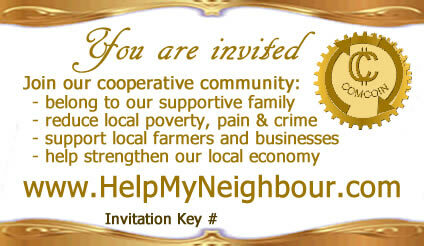 Make sure they know joining our community is by invitation only, and they must use your key to be accepted. 2. Share your knowledge, skills, products, and unwanted things with other members of our cooperative community, by posting them as "offers". Anything that is legal and in decent shape can be posted, from your garage sale items to business products and services. Download the list of our Offer/Want Categories (below) and let it inspire you regarding products and services you can OFFER or may WANT. ● Take the categories list and read one category/subcategory at a time ● Can you offer anything in that category? ● Do you want anything from it? ● Good practice is to offer services/products that you realy like doing or making. ● Request (want) services that you hate doing, or don't have time to do. ● Add the item's picture, if you can, to stimulate more interest. ● Keep content short and clear. ● Search relevant keywords on the site and then visit other members' posted offers/wants for inspiration. ● Keep adding offer/want items, it's free. ● In fact, if you post at least 3 offers + 3 wants, then you are allowed to spend up to CC500 right away. ● Select 2-3 categories for each offer/want, to increase your chance to be found. ● Be mindful of your limitations. ● Do not overcommit nor overbook yourself. ● Keep the currency circulating. You are only allowed to save up to CC500 in your bank, then you must spend some before earning more. 3. Donate ComCoins to HMN. Help My Neighbour site allows members to receive help before they earn any Com-Coins, thus creating a negative value in their account. While most members are motivated to bring their ballance to a positive value, some will not be able to do so. Your com-coin donations will help keep HMN's total ballance positive, to ensure its long-term strength and viability - for the benefit of the whole community. Please note that there is a cap of CC500 that any member can save, in order to prevent hoarding. Hoarding would defeat the purpose of circulating our complementary currency, and would sabotage the success of our cooperative community. Therefore, you must spend or donate some of your ComCoins, in order to make more. 4. Donate ComCoins to other members. .If a member is unable to earn ComCoins due to hospitalization, etc. you can help them bring their negative ballance to zero. Also, a member may need a higher amount of ComCoins in order to obtain a needed product or service. Feel free to participate in HMN-approved fundraisers for members. 5. Donate ComCoins to charities. .This allows charities to reward their volunteers or to buy needed services/products from other members. In order to receive ComCoin donations, a charity must be an active member of HMN. If the charity you want to help is not already a member, you can invite them to apply. 7. Share collective tasks. We are a volunteer-run online community. and each association is only the sum of the actions of its members. That is why it is important to share the tasks related to the proper functioning thereof. Please visit the "Tasks" page, to see if you can help with any of the posted tasks.